The Reserve Bank of India's (RBI) stance, along with an expected hike in the US lending rates and high crude oil prices are expected to further exert pressure on the Indian rupee in the coming week, experts say. In addition, the continuous outflow of foreign funds from the equity segment and global market volatility will likely push the rupee to the 75-mark to a US dollar in the coming days, the experts opined. Conversely, RBI interventions in the spot market via intermediaries might somewhat arrest the sharp decline in the rupee's value, but a range of 73.5-75 per US dollar is expected. 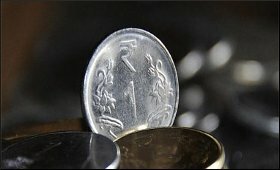 In the week gone by, the rupee touched a fresh low of over 74 to a US dollar in the spot market. It settled at a record closing low of 73.77 (73.7675) per US dollar on Friday, October 5. "The RBI's new policy stance, stress on the NBFC sector and expectations of more rate hikes by the US Fed are expected to weigh heavy on the Indian rupee," Anindya Banerjee, Deputy Vice President for Currency and Interest Rates with Kotak Securities, told IANS. "Volatility is also expected to flare-up from the RBI's side as it is expected to heavily intervene in the market to arrest any abrupt movements. The expected range for next week is 73.5-75 per USD (spot)." The RBI on Friday belied market expectations of a rate hike. However, the "neutral" stance of monetary policy was changed to "calibrated tightening", which triggered a massive sell-off in the equities market. According to Madhavi Arora, Economist, FX and Rates, Edelweiss Securities, the RBI is of the view that it should let underlying trade competitiveness improve gradually as the trade-weighted exchange rate acts as a natural stabiliser. "The RBI also subtly suggested that FX markets are fluid and should let rupee decide it's own equilibrium. While the rupee comfortably crossed 74 on policy day, it did close sub-74, largely owing to FX interventions," Arora told IANS. "The coming weeks would see pressure on the rupee continuing as external and domestic conditions remain unfavourable for the currency. We do not rule out the rupee crossing 75 and would watch out for assertive policy actions by the government or RBI if the currency continues to remain an EM (emerging markets) outlier." Besides, high oil prices might not allow the rupee to make any substantial recovery. On Friday, Brent crude was priced over $84 per barrel. "The rupee is expected to remain under pressure during the next week as the RBI monetary policy has disappointed the market," said Anand Rathi Shares and Stock Brokers' Research Analyst Rushabh Maru. "Rising crude oil prices and the strength in the dollar index might keep the rupee under pressure. The short-term range is expected to be in the 73.20 to 74.80 band." Apart from global cues, any further outflow of foreign funds from the Indian equity and bond markets might have an adverse impact on the rupee. In terms of investments, provisional figures from the stock exchanges showed that foreign institutional investors sold scrips worth Rs 9,522.44 crore during the week ended October 5. On a weekly basis, the rupee closed at 73.77, weaker by Rs 1.29 from its previous week's close of 72.48 per greenback.